TUSCOLA - Carl W. Fogle, 87, died Tuesday, February 13, 2007, in an Abilene nursing center. Services will be 2:00 p.m. Friday, February 16, 2007, in First Baptist Church with Reverend T. C. Melton officiating. Burial will be in Tuscola Cemetery, directed by Fry-Bartlett Funeral Home. 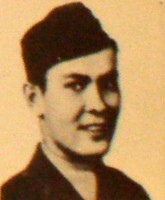 Carl was born August 19, 1919, to A. E. and Vida Haley Fogle in Spring Creek, Throckmorton County, Texas. He raised and showed Hereford cattle with his dad and a brother and exhibited the grand champion of the West Texas Fair Hereford Show in 1937 and 1938. He attended Texas Tech University prior to World War II and served in the U. S. Army during the war. Afterward, he returned to Tuscola to work with his dad and brothers at Fogle Farms. He married Ruth (Jonny) Johns in 1947. Following her death in 1991, he married Ora Lee Brown in 1992. He was an active of First Baptist Church in Tuscola. He worked as a carpenter before retiring to Brownwood in 2000. Following Ora Lee's death in 2002, he moved to Abilene. Also preceding him in death were his parents; two sisters, Loyce Tisdale and Evelyn Osburn; and one brother, Clyde Fogle. Survivors include a brother and sister-in-law, A. E., Jr. and Stella Fogle of Abilene; four nieces, Norma Godfrey, Jan Irby, Carol Chastain, and Janice Allen; one nephew, Ron Fogle; numerous great nieces and nephews; and many friends. The family appreciates the love and care given to Carl by the staff at Hendrick Wisteria Place and later Mesa Springs Healthcare Center. Remembrances can be made to Hendrick Hospice Care, 1682 Hickory Street, Abilene, Texas 79601.